There are morning people. And there are not. I am firmly convinced of this. And I am not a morning person. When people say they are morning people, do they mean that they wake up with a spring in their step, a song in their heart, and a smile on their face? Nope, not me. But I am not sharp. Or friendly. Don’t ask me anything but the most basic of questions. You won’t like the response. It took all I had to control my morning-ness when people had to get to school and work, dressed and on time. But now that I don’t have children at home, or a regular job, it’s a lot easier to manage the morning. It’s now become my best computer time. With a cup of coffee (definitely coffee – tea won’t do) and maybe a little breakfast. That’s the trouble with us non-morning people. We really don’t do breakfast. And we should. Might make us more pleasant. So I’ve been giving granola bars a try. Homemade ones. And, you know? They’re very good. They’re not exactly cheap to make, but they’re very good. And they put a smile on my face, if not a spring in my step. I didn’t have wheat germ the first time I made these. Instead I ground some Grape Nuts in the food processor. Good substitution. And I didn’t have dried apricots. That’s okay. These have plenty of good stuff in them. Preheat the oven to 350 degrees F. Butter an 8 by 12-inch baking dish and line in with parchment paper. Toss the oatmeal, almonds, and coconut together on a sheet pan and bake for 10 to 12 minutes, stirring occasionally, until lightly browned. Transfer this mixture to a large mixing bowl and stir in the wheat germ. Place the butter, honey, brown sugar, vanilla, and salt in a small saucepan and bring to a boil over medium heat. Cook and stir for a minute, then pour over the toasted oatmeal mixture. Add the dates, apricots and cranberries and stir well. Makes about 12 to 16 bars. I'm definitely not a breakfast-first-thing-in-the-morning person. I need a while to wake up before I even start to get hungry! I love breakfast foods for dinner, though! I am a morning person; great in the morning, but after supper I am useless; not a good thing when you have company.I would eat these healthy goodies anytime of the day. While I am up most mornings by 6, even on the weekends, this comes from an inability to sleep...there is certainly no smile on my face, and don't get in my way until I've had my coffee. These look delicious, Rosemary. 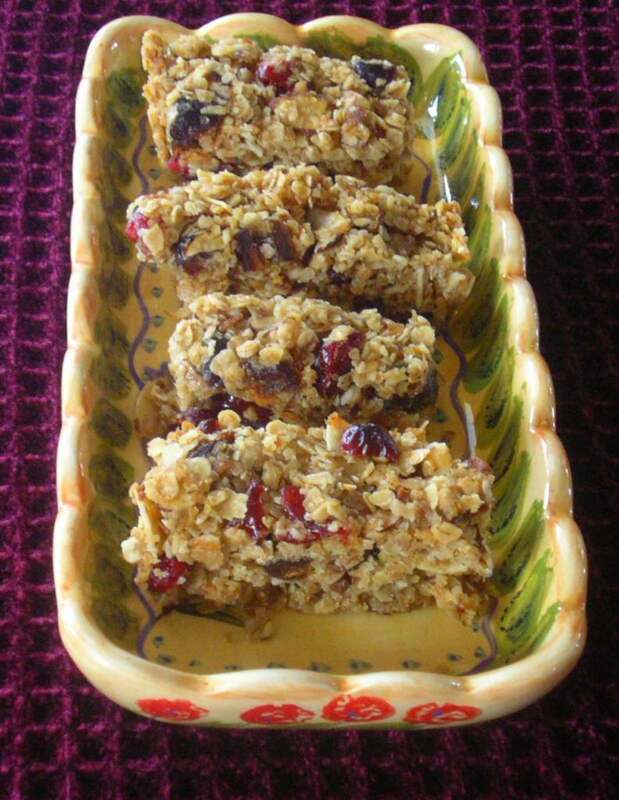 I've made homemade granola many times, but have never made bars. I'm exactly the same way! I've just learned to keep my mouth shut until at least 9 or 10:00 because otherwise nothing very nice will come out of it! From one non-morning person to another - these would be a grand breakfast. I married a man and had a son who were morning people. They can be scary in the a.m. - all smiles. Daughter and I would appreciate your granola bars. We could even say "thank-you" in the morning. But that's it. Granola is definitely the way to go-sometimes I just eat granola cereal plain right out of the box. However, the bars you have made here are surely much better with all that fruit packed in there! Yum! I am a morning person. And I would love those for the breakfast too! I smiled when I read this, Rosemary! I AM a morning person. Doesn't matter...I'd still love these bars! I have yet to make some granola bars. You sure know how to substitute the ingredients! Brillant! Hey! These look pretty good ... although, I wouldn't have them first thing in the morning either ... I'm more a two cup of coffee gal in the morning ... maybe a brunch bar at around 10 AM ... that's the beauty of being retired ... right? One can change one's clock around to one's desired routine. Glad I tracked you down, Rosemary! I used to think I was a morning person until I had children. Suddenly sleep became a precious commodity and getting out of bed an ordeal. I am more of a mid-morning person now. That time right after the last child has headed off to school until lunchtime is my favorite, most productive time of day. I still eat breakfast at the crack of dawn though, when the first teenager gets up to start the day. A batch of those granola bars would be something nice to wake up to. I actually am a morning person--and I need a good breakfast to start my day. Love the idea of these homemade granola bars--I've stopped eating store granola because of how much junk it contains. I also think you can grow out of being a morning person too :) I used to be but I'm not really more. I still get up early but I like to lay around and drink my coffee and read the paper and nibble YUMMY GRANOLA BARS! Want! Here I am again, Rosemary ... hope you decide to accept my nomination for fulfilling food blogger unplugged fun interview ... I have been so intrigued since I found your spot! Hey...thanks for dropping by! If I made these, I would have to leave out the coconut- but other than that, they look pretty good. These yummy granola bars would be my choice of breakfast, since I'm not a breakfast eater. 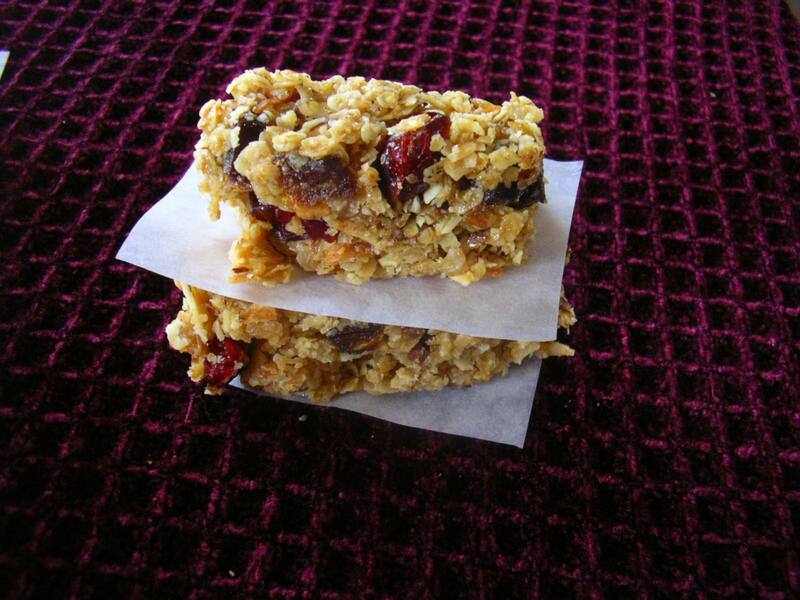 Love the granola bars, so healthy, yummy, and full of flavors that are so good for you! Thanks for sharing the delicious recipe, that I certainly want to make...asap! Smile. I'm a morning person...sort of...I don't wake up earlier than seven, ever! But I don't sleep in past 8:30 much either. Thank you for sharing such a nutritious and satisfying recipe. I hope you are warm and full tonight. I'm about to put on a pot of soup and cozy up with a book. Love from Austin.